I know, I know, you don't expect a Disney fan blog to talk about politics, but, dear Disney and more readers, tomorrow's election of the next president of the United States is such an important issue - not only for the United States but also the whole world - that i can't avoid to talk about it. After eight years of a Shakespearian tragedy - i always thought that if Shakespeare was living now he will surely write a great play about that-son-who-wanted-to-do-better-than-his father...and the consequences - it's time for America to say Stop! to all this madness. If we except the decision to create a natural park in the area of Hawai to protect sealife, it's hard to find one good decision in eight years of Bush administration. 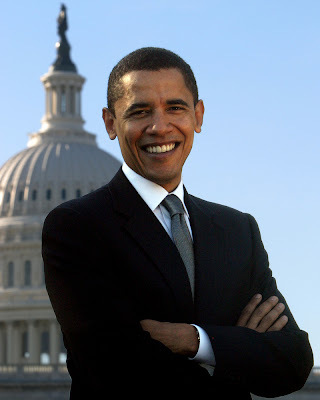 Barack Obama is not only a great hope for America, but also for the rest of the world. He has the intelligence, the vision, certainly the wisdom, to lead America - i should say to save America - out of the dangerous grounds where the previous administration did put it. You have no idea, dear American readers, how we would love in France to have somebody like Barack Obama as president. Really. For those of you who missed it, i've embedded below the thirty minutes Ad of Barack Obama which was aired last week. Not only the filming, the photography and the editing is beautiful - not to mention Barack's message - but this short movie has sometime the spirit of a Norman Rockwell painting. Have a look to it, you'll understand what i mean. Tomorrow's election will change in a way or another the destiny of America and the fate of the world. And it's all in your hands, dear American readers. Every country in the world is watching with hope and apprehension the result of this election. We know that America can be a great country who will inspire again respect and admiration instead of hate and fear. We know you can do it. So, please, tomorrow, give your vote to Barack Obama. Note: All anonymous or hatred comments - whether they are against Barack Obama or John Mc Cain - will be deleted. I couldn't agree more! Let's all hope this horrible Bush era ends soon. I'm sorry to say that i disagree with you. It's the current administration which destroyed the American dream. Alan Greenspan economy policy approved by the Bush administration is responsible of the present economy mess - he even admit it himself! May i remember you America economy golden days when Clinton - a Democrat - was president? At that time America was respected, and not hated in the rest of the world. Personally, i don't hate America, of course, but lot of other people around the world do, as we know. I won't delete your comment because i always thought that discussion can be positive, but, frankly, to compare Barack Obama to Fidel Castro is not reasonable. First, because Obama will have to do with reality - and it's a tough one that awaits him. And, two, simply because he's not communist. No american will lose his freedom with Barack Obama - Bush's "patriot act" already took a lot of it. The only thing that americans have to do is to transcend their fear. It's strange to see such a powerful country and to have so many people to be afraid of, for some of them... everything? Things will change, it's inevitable, not because of Barack Obama, but because the reality of the world is changing. Even if Mc Cain was elected it will change. Simply because the USA use about 25% of the planet resources, and it can't last forever. Everybody has to grow up one day and begin to be more responsible for the community, and this mean sacrifices. Not only for the u.S, but also all occidental countries, including mine. This won't be easy because the "System" ( with a big "S") succeed to make each of us believe that we couldn't live without the last Lcd screen or the most fashionable Nike shoes, but it's all about mental images. This is really what is waiting all of us: to be able to transcend mental images. Because, just in case you didn't noticed it yet, it's not human beings, but mental images which are ruling the world - including our "own" world. I know, it's real human being who, for instance, are ruling America's government, but what is ruling them? What is at the origin of their power or ambition? You got it? It's mental images. I could explain more about this easily, but i suddenly remember that my blog is a Disney blog, not a master class of philosophy! Anyway, don't be afraid, give your vote to Barack, and everything will be fine, believe me. Thanks for the great post Alain - it's good to remember that we're all in this together. It will indeed be wonderful to see a spirit of cooperation return to trans-Atlantic relations. Despite all the fear-mongering and ad-hominem boogeyman nonsense being pumped into the discourse, it seems that my fellow citizens are actually going to do the right thing this time. I can't wait for tomorrow night when we throw out these neo-fascist right wingers. It's about time this country put capitalist tools in check. I totally agree with Barack's statement about spreading the wealth. These rich people have gotten off for far too long with paying far too little. I'm sure that President Obama will correct that. No one should be surprised when we wake up on Wednesday and certain foolish Americans feel that their world has ended. The beginning of the Revolution is upon us! I knew that my endorsement for Obama was going to be a bit risky, and there it goes! But i truly want to thank you who left a comment and who will NOT vote for Obama to don't be angry after me. I want to give a fair answer to "blank stare" who asked me what i think of Sarkozy. Honestly, he could be worst, which means that until know - if we except his disastrous immigration policy - he try to do his best. Also, i think we must give a big thanks to his wife, the lovely Carla Bruni, as obviously she calm him down ( don't know how she does it, but she does it well ). As for the question of who in the world hates Ameica: first, people don't hate American people, they hate the Bush administration policy. And i can assure you that it's not a question of only people from the left. Go anywhere in Europe ( i don't even mention the Arab countries ) and almost EVERYBODY right or left will tell you that they consider Bush as the worst president in all United States history. 100% of people of the "left" and 70% of people of the "right" will tell you this. Really, no kidding. Finally, to those of you who would prefer me to come back to my Disney articles, don't worry, it will be the case tomorrow, and also coming this week two great artwork articles with stuff you've never seen before, don't miss them! But, hey , talking politics one day each four years is not dramatic! Agree with you entirely, Alain. Too long this nation has been guided by policy based on prejudices related to the cold war or to faith, often to the exclusion of reason. I'll do my part to lead my country away from this self-destructive course. Thanks for opening this discussion, Alain! This election is everyone's concern, for sure - not just for us Americans. I'm very interested in hearing the opinions of people from other parts of the world. It may be telling that we have not heard much support for McCain and Palin outside of the U.S.
We are a split country, with strong passion in all directions, as our polls have shown. Let's all hope what is voted on tomorrow - not only our leaders but the many important propositions this time -will be the best for our world. And we should look on the bright side: When the important issues that affect the health and well-being of our planet and its people are being carefully addressed, we'll have more time to focus on those less important things we all enjoy together...such as Disney. "(…) many here don't like to see the rest of the world trying to influence who we vote for." You might try and consider the international views on the elections as an exchange of ideas. Something which might have become rare under Bush' administration, no doubt: "who's not with us is against us." Actually I agree with other posts here: I don't think this blog is the right place to express political views. I am in favor of exchange and political discourse, but not on a disney and more site please. I already explained why i am endorsing Obama: it's because TODAY there is nothing more important in the world than the U.S presidential elections. The destiny of America AND the fate of the world depends of who will be elected. I think there is no doubt about my love for Disney and Imagineering, but, sorry, today, the destiny of the USA and the world is more important than anything. Whatever is the result, tomorrow we'll be back to the great Disney and more articles you all love. When I was nine years old I visited Epcot in its opening month. World Showcase was an essential piece in opening my mind up to the world beyond America. So twenty five years later, I highly appreciate hearing your viewpoint. And am happy to see that Europe is looking for an inspiring and intelligent president to lead America, just like many of us here. Thank you for sharing your and Europe's opinion and outlook. And I think it is appropriate on your blog because its this kind of dialogue that Walt was driving at in its a small world. And its Obama's message of hope that resonates so similarly to Walt's. Freedom of speech must endure even in these oh so politically correct days. I'm so PROUD of America tonight! This is HUGE. It's HISTORIC. I am filled with admiration and respect for President Elect Barack Obama who I think is simply a brilliant guy. He makes me feel proud to be an American, and even better than that, he makes me feel inspired to get in there, get active and do whatever I can do to help make my country - and even the world - a better place. I say more power to him - and to all of us who will make it happen!